GoPro is going to questionable extremes. The maker of wearable high-definition cameras pitches itself as an emerging media brand for its initial public offering. It’s a clever trick given the limited lifespan for standalone photography hardware, but could easily lead to a face-plant. The company rode, and helped create, a wave. Cameras became more reliable and the growth of social media made it easy for amateurs to post videos of BASE-jumping thrills or cycling mishaps. GoPro convinced celebrities like snowboarder Shaun White to use its gear. The result was compelling viral advertising and 87 percent growth last year to nearly $1 billion in sales with consistent profitability. First-quarter revenue shrank 8 percent from a year ago, however, and operating earnings halved. The company blamed delays rolling out its latest cameras. Rivals could just as easily be a problem. GoPro also will have to contend with shrinking electronic components and prices that should enable goggles and other gear to house cameras and cellphone makers to incorporate the technology. That’d make its Hero3 go the way of the digital point-and-shoot. Building the brand, therefore, makes good sense. 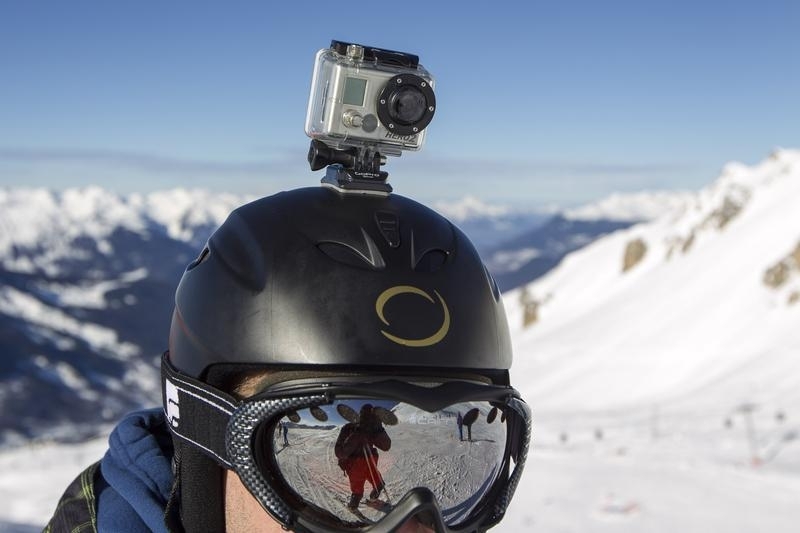 For now, GoPro’s name is synonymous with helmet-cams, which gives it a first-mover advantage. Over the longer run, it wants to expand its media network. While its 1.8 million YouTube subscribers and 2 million Instagram followers didn’t generate any revenue last year, it’s easy to see marketers wanting to reach these adrenaline junkies. The GoPro name also could work on other products and services. Ad sales alone won’t do the trick, however. Disney, for example, just acquired Maker Studios for a sum that could reach $1 billion. Its channels already boast 380 million subscribers. That’s 200 times more than GoPro. The camera maker was valued at more than $2 billion two years ago. Apple, meanwhile, paid about two and a half times revenue for Beats, another company with aspirations beyond just branded hardware. Though GoPro doesn’t have a deep-pocketed buyer right now, the same multiple would peg it at about $2.5 billion. That suggests GoPro will have to embrace its hardware roots to avoid a valuation wipeout. GoPro, a manufacturer of wearable cameras, on May 19 revealed plans for an initial public offering. The company generated revenue of $986 million in 2013, an increase of 87 percent from the year before. The company’s net income increased 88 percent to $61 million. It has been consistently profitable over the past four years. Founder Nicholas Woodman and his family control 49 percent of the stock. Just over 10 percent of GoPro is owned by a unit of Foxconn. The Chinese contract manufacturer invested $200 million in 2012 in a deal that valued GoPro at more than $2 billion.